„Acute Abdomen“ is medical shorthand for a sudden onset of abdominal pain requiring immediate surgical intervention. The term should therefore be used with care and only if warranted by the severity of the clinical picture. Otherwise one speaks of an ‘unclear abdomen’, which does not require immediate surgical intervention, but which can be further clarified by additional diagnostic workup. Clarifying the diagnosis, of course, should never be allowed to delay treatment. The patient should therefore be observed very closely to accurately assess the severity of the condition and to be able to react immediately if there is a sudden worsening of his or her condition. The classification of acute abdomen into further degrees of severity is rather academic in character. The distinctions are blurred and in each case a decision must be made whether there is time for further diagnostic workup or whether immediate surgery is indicated. The full clinical picture of an acute abdomen is characterized by severe abdominal pain, circulatory shock, and rigid abdomen. The latter is caused by an indirect activation of the entire abdominal musculature due to peritoneal irritation and is called peritonism, which should not be confused with peritonitis, or inflammation of the peritoneum. Peritonitis can be a contributory cause, but must not be present in every case. The patient’s medical history can provide initial clues regarding the origin of an acute abdomen. The patient may be able to give a precise description of the nature of the pain. Dull, visceral pain points to a cause in the parenchymatous organs, whereas spastic, colic-like pain implicates muscular hollow organs. A burning, cutting pain can originate in the peritoneum. A shifting pain is also suggestive. Early periumbilical pain that shifts later to the right lower abdomen is typical of -- but not definitive for -- appendicitis. A temporal connection with food intake or other possible triggers can be equally meaningful. Physical examination can more precisely locate the site of abdominal pain. There are specific points of tenderness for appendicitis, though they are not necessarily conspicuous. Neither the presence of tenderness points nor their absence confirms or excludes an appendicitis. Administration of pain medication changes the clinical picture of acute abdomen, but not such that surgery may not be indicated at some point. Patients with acute abdominal pain should therefore be given early effective analgesics, even if the patient is going to be referred to another doctor for further diagnostic workup. Certain maneuvers can increase the patient’s pain, e.g. drumming on the abdomen, contralateral release (Blumberg sign) or application (Rovsing sign) of pressure, and flexing the thigh at the right hip against resistance (psoas sign). The digital-rectal exam is as much a part of routine diagnostic workup of acute abdomen as checking the hernial opening in the groin. The list of the possible differential diagnoses for acute abdomen is long. In principle the adage always applies: „What is common is common“, for as the adage continues: “and what is rare is rare, and whoever commonly diagnoses the rare and rarely the common, commonly diagnoses wrong and rarely diagnoses right.” So, while rare exotic diagnoses (Kolibri-Diagnosen) should not be ignored, first consideration must be given to the most common relevant diagnoses. In Western Europe, appendicitis is the most common cause of acute abdomen (>50%), followed by cholecystitis and ileus. Perforated stomach ulcers and duodenal ulcers have become much less common due to the use of proton pump inhibitors. In addition to pancreatitis and disorders of the small bowel, diverticulitis also plays an important role. Basic diagnostic measures include in addition to taking blood samples and clinical exam, x-ray of the abdomen. This should be done with the patient standing or, if this is not possible, in the left-lateral position. This can detect free abdominal air, an indication of hollow organ perforation. The absence of an air crescent sign in x-ray, however, does not definitively exclude hollow organ perforation. Sonography can assess the volume of free abdominal fluid, or recognize specific signs of cholecystitis and/or cholecystolithiasis, an appendicitis, diseases of the adnexa, and possibly nephrolithiasis or bowel wall thickening in diverticulitis. The goal of the basic diagnosis is to determine whether the patient requires immediate surgery, delayed surgery, or surgery after further diagnostic workup. Therapy for acute abdomen is immediate laparotomy and/or laparoscopy. The procedure is always directed of course at the underlying disease. An acute appendicitis can usually be treated laparoscopically; as a rule, only a free perforation with peritonitis makes laparotomy necessary. 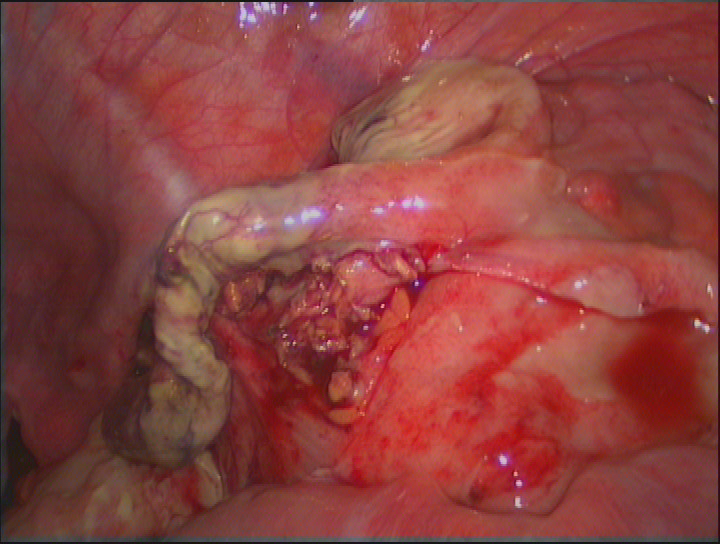 If despite unequivocal clinical findings (Klinik) an inconspicuous appendix is found intraoperatively, a search should always be made for a Meckel's diverticulum. This residuum of the omphalomesenteric duct is always located antimesenteric in the small bowel, about 80-100 cm above the ileocecal valve (Bauhins valve). Since scattered (versprengtes) stomach or pancreas tissue can be found here, it is possible that such a diverticulum causes symptoms like appendicitis. If a Meckel’s diverticulum is present, it can be easily ablated with a stapler. If a hollow organ perforation is suspected, the patient should by placed in the lithotomy position, since a transanal anastomosis may have to be made if, for example, a sigmoid perforation is involved. Acute abdomen can have diverse causes. With increasing age, appendicitis becomes less likely the cause. Circulatory disorders of the bowel are much more common in the elderly than in the young and constitute a large proportion of cases of acute abdomen in this age group. 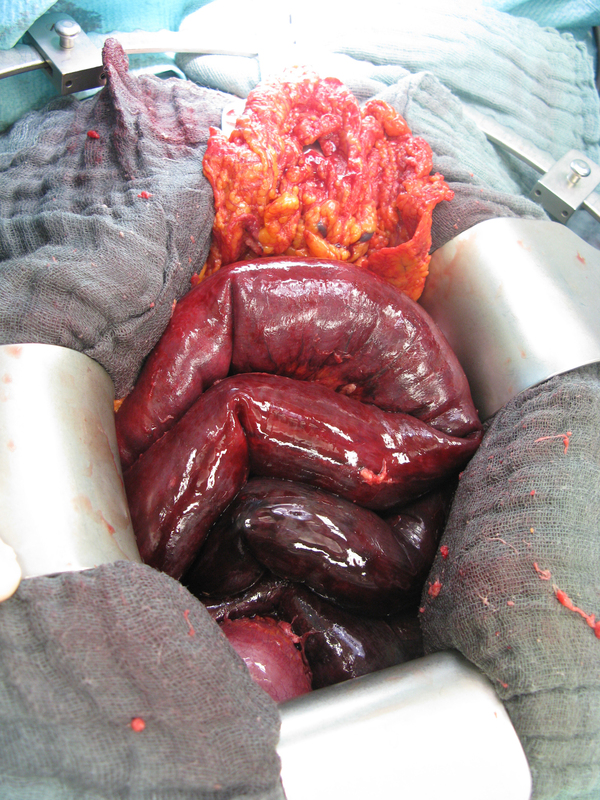 Mesenteric ischemia constitutes an absolute visceral- and vascular surgical emergency. The inadequate blood flow can give rise to gangrene of the bowel wall, which in turn can lead to a breakdown of the barrier function of the bowel. The result is a transmigration peritonitis or perforation of the bowel, leading to abdominal sepsis associated with an extremely high lethality. The most common cause of mesenteric ischemia is an embolism of the visceral arteries which, due to the anatomic configuration, usually strikes the superior mesenteric artery. Depending on the size of the embolism, the main stem of this artery can be affected or only a branch. The further peripheral the vessel is occluded, the less bowel will become ischemic, which has a direct influence on prognosis. Short segments of ischemic or even necrotic small bowel can be resected without causing problems. The more extensive the resection is, however, the greater the likelihood that the patient will develop a short bowel syndrome. As a rule, a residual small bowel length of 70-100 cm is to be expected. If no gangrene has occurred, in larger ischemic segments revascularization by means of mesenteric embolectomy or aorto-mesenteric bypass surgery should be attempted. A further possible cause of a mesenteric ischemia is a mesenteric venous thrombosis, often associated with peripheral arterial occlusive disease (PAOD). Another possible cause is "nonocclusive mesenteric ischemia (NOMI). Since this is caused by vascular spasm, the treatment of choice is intravascular application of spasmolytics and vasodilators. You see here CT images of a mesenteric ischemia. Two typical signs of mesenteric ischemia are readily visible. In the bowel, a pneumatosis intestinalis is evident. 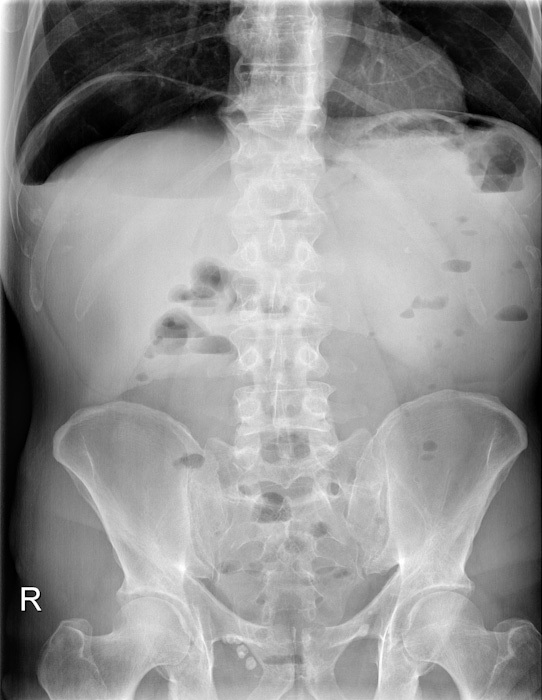 These gas cysts in the bowel wall arise from the ongoing necrosis. Gas pockets visible on CT form due to decay processes and breakdown of the intestinal barrier. Since the bowel drains via the portal vein into the liver, the gas also collects in the liver. This hepatic-portal venous gas is called pneumoportogram.